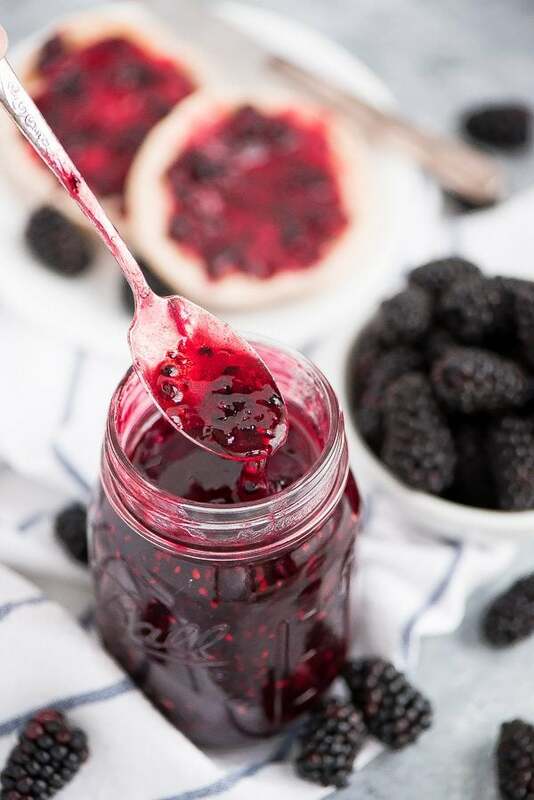 It takes just five simple ingredients to make this fresh Blackberry Freezer Jam. After your first taste you’ll be spreading it on everything. I am one lucky girl. My mother made everything from scratch when I was a kid. 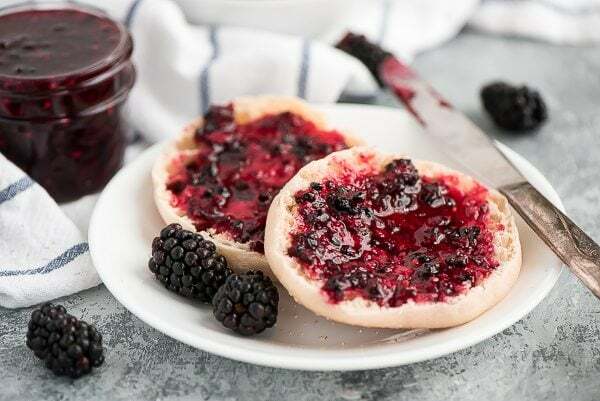 As grateful as I was to always have food… great food, I didn’t fully realize how good I had it until I went to college and ran out of my mom’s homemade jam. I decided to grab a jar off the shelf at the store, used it once, and never touched it again. It just didn’t compare to the scrumptious taste of mom’s freezer jam. Once you try freezer jam, you’ll never go back to cooked. So why is freezer jam so amazing? I’m glad you asked! I’ll tell ya! First, the amazing taste. Freezer jam is not cooked so the integrity of the flavor of the berry stays intact and true to how a fresh berry tastes. When berries are cooked, their taste changes. I notice it most with strawberries. Second, you don’t have to know a thing about canning methods. Or in other words, you don’t have to worry about anyone you love dying of botulism from your jam. Third, no special equipment needed! I hate having my cupboards filled with things I use just once a year. For this recipe, all you need are containers- plastic or jars, a pot, potato masher, and a freezer. I’m pretty sure you’ve got all of these but if you don’t they are very affordable. Fourth, it’s more spreadable. Sometimes cooked jam or jelly is as thick as jello and so awkward to spread on bread. Freezer jam is thinner/more runny than cooked jam, and it’s only heated on the stove briefly to dissolve the sugar. 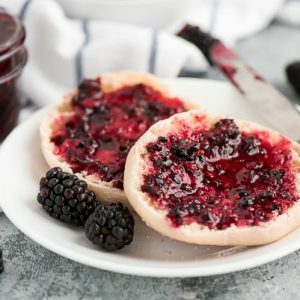 I’ve tried many flavors of jam but my current favorite is this Blackberry Freezer Jam. You, of course, first need to start with prime berries that are sweet, not tart. I like to spread it on English muffins, toast, peanut butter sandwiches… I want to eat it on everything! In fact, I always lick the spoon. No wasting this liquid (semi-liquid?) gold! Enjoy! In a large pot (off the stove), mix the blackberries and lemon juice together, and sift in the pectin a little at a time while stirring. Once all the pectin is mixed in, set a timer for 30 minutes and give the fruit a stir every 7 to 10 minutes. After the 30 minutes, stir in the corn syrup and then place the pot on the stove over medium heat. Stir in the sugar a little at a time and cook for about 5 minutes until the sugar is dissolved (it should be good to go when the jam reaches 100 degrees F or you can just rub it between your fingers to make sure you don't feel any grains). If it is cooked longer it will be quite runny. 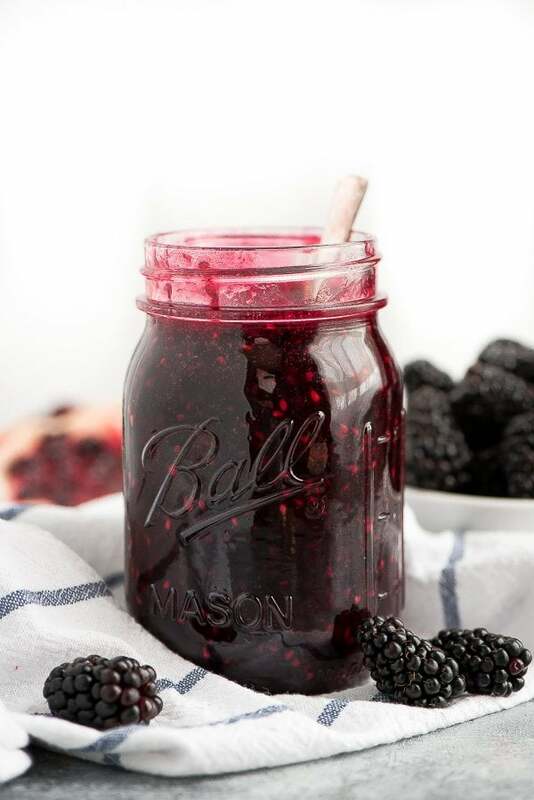 Pour the jam into clean plastic containers or glass jars and place in the fridge and/or freezer. Jam lasts about 3 weeks in the fridge and up to 6 months in the freezer.